FRAMINGHAM, Mass., July 17, 2018 – A new International Data Corporation (IDC) survey found that cloud service providers have a high degree of confidence in their business outlook as a result of very strong customer demand for cloud services to enable Digital Transformation. 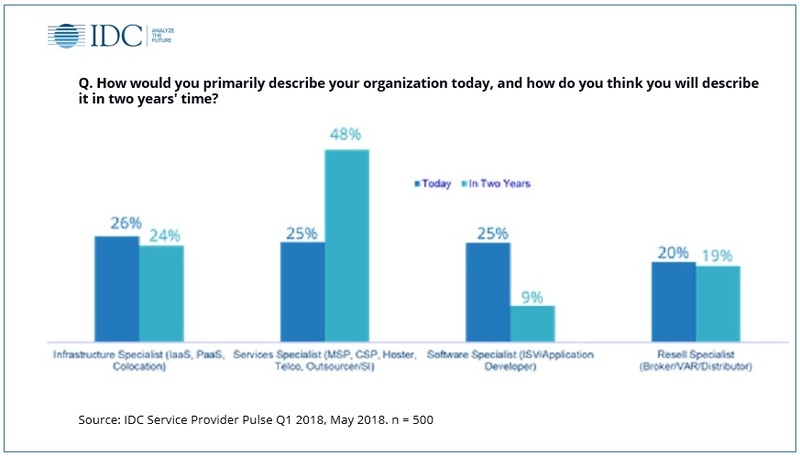 This is the first survey from the recently launched IDC Service Provider Pulse, the latest subscription service available from IDC Cloud Primary Research which provides a complete understanding of suppliers, buyers and consumers of cloud products and services across the entire ecosystem. "Cloud service providers around the world are rapidly changing their business models in response to unprecedented customer demand, offering a mix of new cloud infrastructure, application, and managed services as part of an agile investment strategy," said Rory Duncan, research vice president, Cloud Service Providers at IDC. "What is striking is not only the pace of transformation, but also the variety of offerings coming to market as a result. From managed cybersecurity to performance optimization, the hosting of complex business applications and hybrid cloud are offering the potential for service integration at point of delivery." Cloud service demand due to Digital Transformation is outpacing supply, with service providers ramping up their investments in new offerings to cater for their client's requirements for new infrastructure, application, managed and professional services in the cloud. "It's clear that the 'long tail' of Tier 2 and Tier 3 service providers is driving growth in emerging service opportunities and regional markets," said Michelle Bailey, group vice president, general manager and IDC Research Fellow for IDC's Cloud, Datacenter and Digital Transformation services. "We have learned that over 60% of these providers' client base consists of organizations creating new products or markets as well as those reinventing their businesses – and they need to invest in infrastructure and services to achieve this."